Is The U.S. Dollar Bull Market Over? The U.S. Dollar Index (DXY) has been soaring higher since September 2014. At that time, the U.S. Dollar Index (DXY) traded around $85.00 per contract. Today, the U.S. Dollar Index is trading around $99.75 per contract. Many talking heads on the financial television channels are calling for a collapse in the U.S. Dollar, but that has not occurred. In fact, the U.S. Dollar Index has actually strengthened since bottoming in early 2008 when it traded as low as $70.69. This year, the U.S. Dollar Index topped out on January 3, 2017 at $103.82. Since that top, the U.S. Dollar Index has actually been making lower highs on the daily chart. Lower highs are generally a bearish indication for lower prices, but at some point the U.S. Dollar Index will find a solid institution support level and be defended. Over the past few weeks, President Trump has voiced his opinion that he likes a weaker U.S. Dollar because it will help boost U.S. exports. Since that statement by President Trump the U.S. Dollar Index has continued to declined further. According to the current chart pattern it seems like the U.S. Dollar Index is simply going through a normal correction after such a big run in price and time. 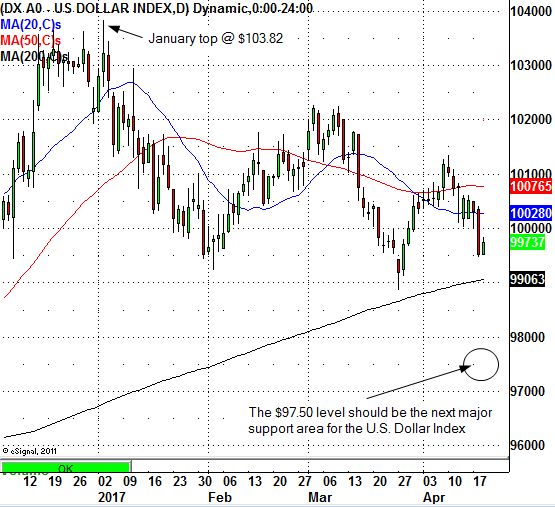 In the near term, the charts are signaling a decline in the U.S. Dollar Index to the $97.50 level. This area should be where the institutional traders will be waiting to support the U.S. Dollar Index (DXY). The larger time-frame pattern signals a U.S. Dollar Index move all the way up to the $105.00 level ultimately. What can be the catalyst for this move higher? Perhaps, problems in Europe, Japan and China. Who knows? This is why I follow the charts, the money flow and chart pattern tell us the trade. So what is the trade setup? When the U.S. Dollar Index declines to the $98.00 - $97.00 level it is time to buy the Greenback. Some ways to play the U.S. Dollar on the long side are to buy U.S. Dollar Index contracts (DX-M7), or the PowerShares DB US Dollar Index Bullish ETF (NYSEARCA:UUP).